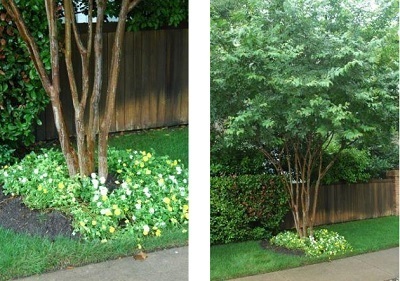 There is a big push to plant crape myrtles in the city of McKinney, Texas these days, and in other cities as well. They are beautiful trees and unless they are overused, they will be an asset to the landscape. 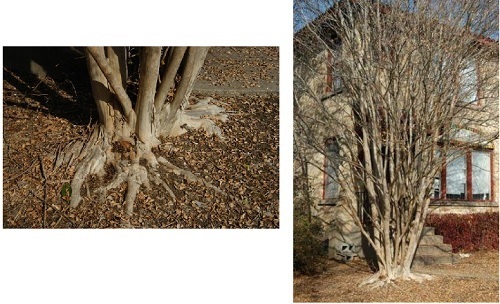 The landscape industry is finally helping with crape myrtle management by stopping the cutting back of the tops of crape myrtles in the winter. This tree butchery is a silly waste of time (same goes for other trees) and it is actually bad for the flower production. It should go without saying that the structure of the tree is ruined by 'topping" back the trees. Even the seed pods should be left. They are decorative and the seeds feed the small birds. Common Name: Florida Wax Scale (Ceroplastes floridensis). Common Hosts: Crape myrtle, deodar cedar, elms, hollies, loblolly pine, oaks and other hardwoods and softwoods. Description: The adult is approximately 3 mm wide; circular, raised, dirty white to pinkish with a wax cover. The nymphs are smaller and star shaped. Importance: Severe infestations may result in shoot or branch dieback. 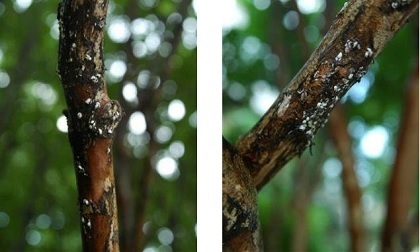 Signs of Infestation: Foliage discoloration and shoot dieback. Soft waxy domes adhering to leaves, shoots and trunks. Sooty mold is often present as the result of scale. Control: Promote tree vigor and health and approved organic insecticide for infested trees. Best choices would include horticultural oil, fire ant drench or any quality essential oil product and spinosad. Apply the Sick Tree Treatment for long term control. The shiny black lady bug with two red spots on the back will also help and should be protected. Soft Wax Scale (Ceroplastes destructor) is a similar pest. This scale attack has apparently been fairly common, but I had trouble finding an example. Finally, I found one and once again the tree was too deep in the ground, partially because of the flower bed built under it. The scale can be killed with most of the organic pest control products, but getting the root flare exposed is the real solution. The most common cause of the insect attacks is that the trunk flare is completely buried. Almost all newly planted crape myrtles, like this one I found, are planted too deep in the ground. They need to be planted with the flare well above the ground. If it’s too late, the soil should be removed with the air spade. Homeowners can do the work, if they are very careful, with gently running water and a shop vac. A stiff brush like a horse brush will also work. This is what the flare should look like on a crape myrtle. Here is the basic information on crape myrtle from my Texas Trees Book.